A few weeks ago, I read an article about fun DIY projects that we love, but that in reality, we will never do. A few were pretty intense, but one stood out. 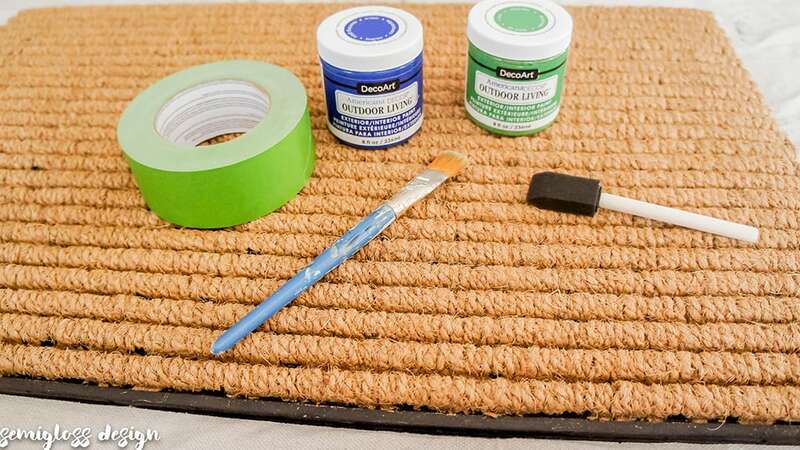 It was a very simple painted doormat that would probably take less than 10 minutes to complete. How did that simple project get on that list? But then I realized that I had never painted a doormat either, so I went and cried about my hypocrisy. Just kidding. I didn’t cry. 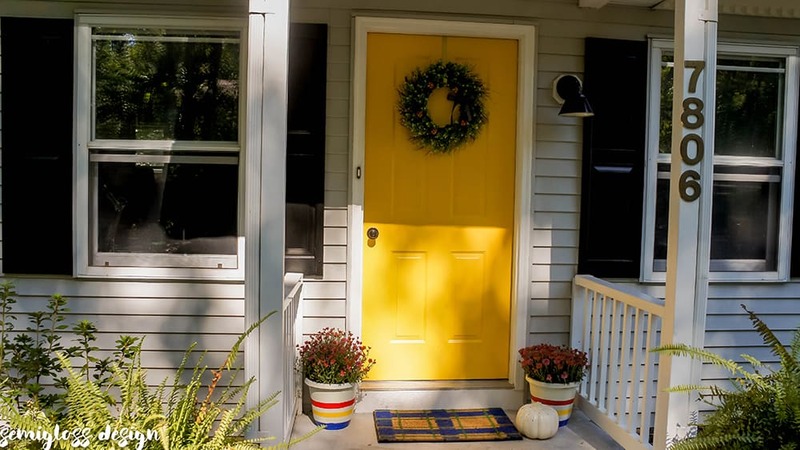 But I did come up with a plan to paint a plaid doormat to complete my curb appeal upgrade! 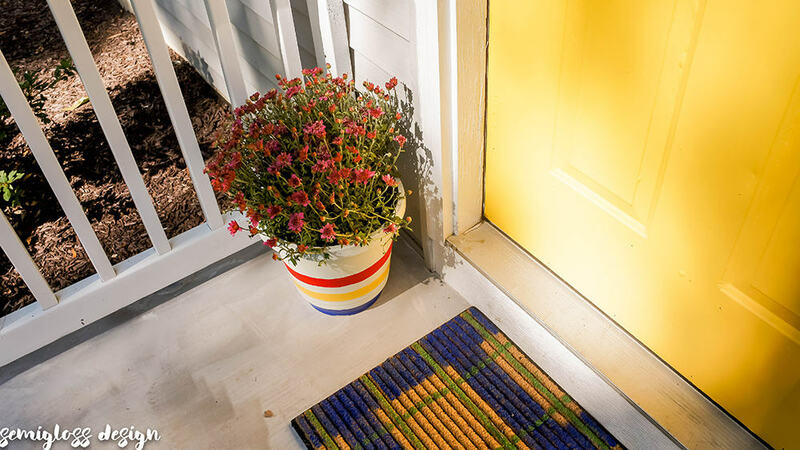 One of my favorite things about DIY is getting to invent things that you can’t walk into a store and buy, like my DIY welcome mat. This post is sponsored by DecoArt. DecoArt provided me with paint for this project, but all thoughts and opinions are my own. I would never recommend products that I wouldn’t buy or use on my own. Since I love paint, DecoArt is a perfect fit for me! I’m looking forward to trying more products and telling you all about them! Your support helps me make more projects like this one! 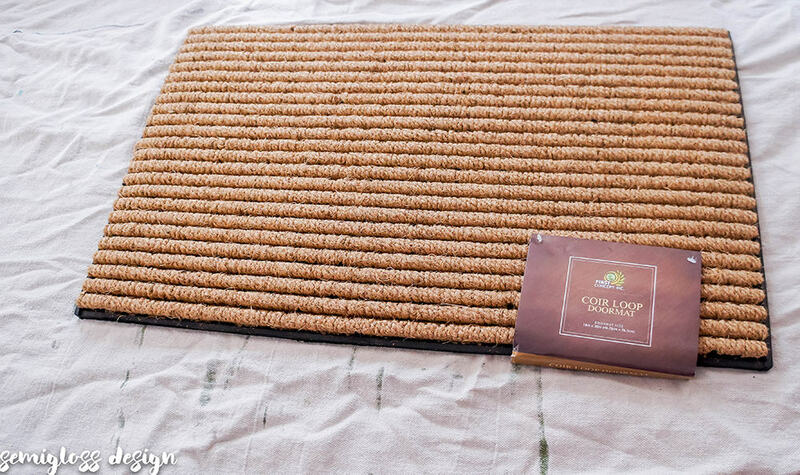 Start with a plain coir welcome mat. Figure out your spacing. My doormat has grooves which helps with spacing. In most plaid designs, one color is thick and one is thin. 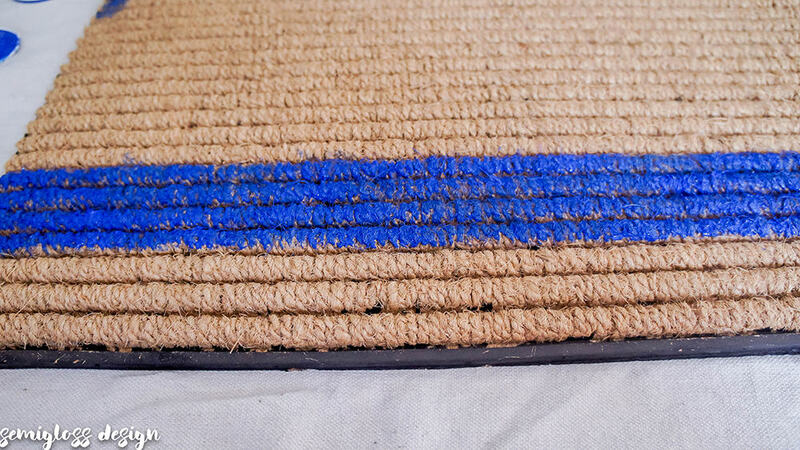 I decided that blue would be thick and green would be thin, with the coir color as the background. My blue line is about 4 inches thick and my green lines are about 1 inch thick. I painted the horizontal lines first since they were already determined by the grooves on the mat. 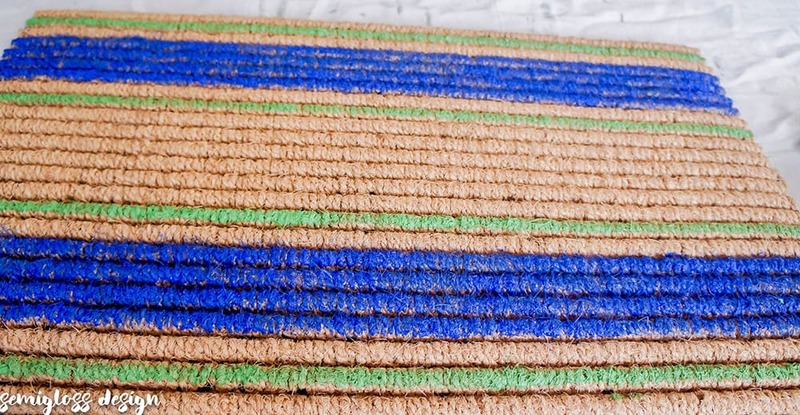 You could leave it like this and have a striped door mat! When the paint was dry, I went back and added the vertical lines. 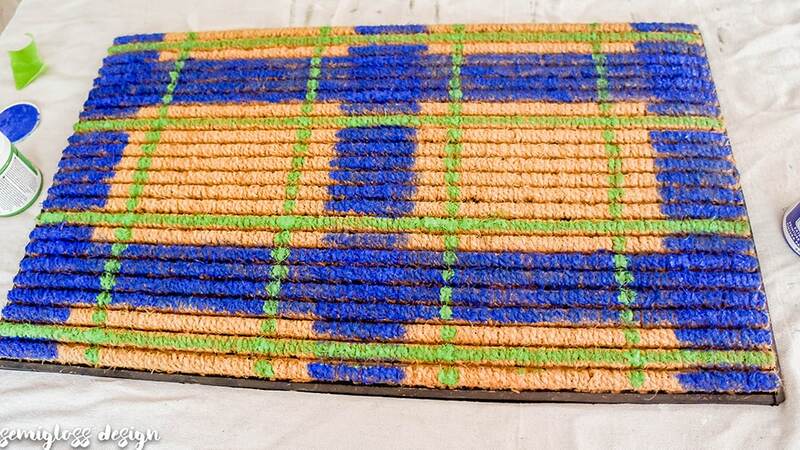 I wanted the coir to show through as the background color, so I kept my plaid pattern minimal. 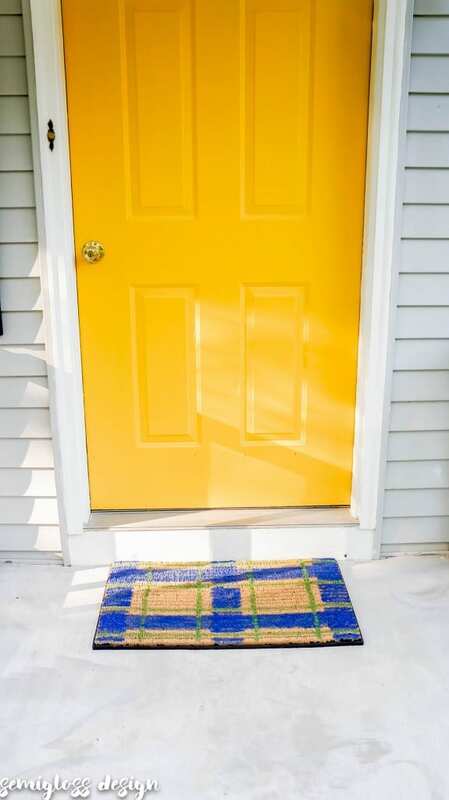 Once the paint was dry, I put my DIY welcome mat in front of my lovely yellow door. I love the way these colors look together! A foam brush provided better coverage than a paintbrush. It was able to get in all of those nooks and crannies. If your lines aren’t perfect, don’t sweat it! Coir is very forgiving! DecoArt Outdoor Living is specially formulated for outdoor use. More importantly though, it covered in ONE coat! Gotta love that! So, what do you think? 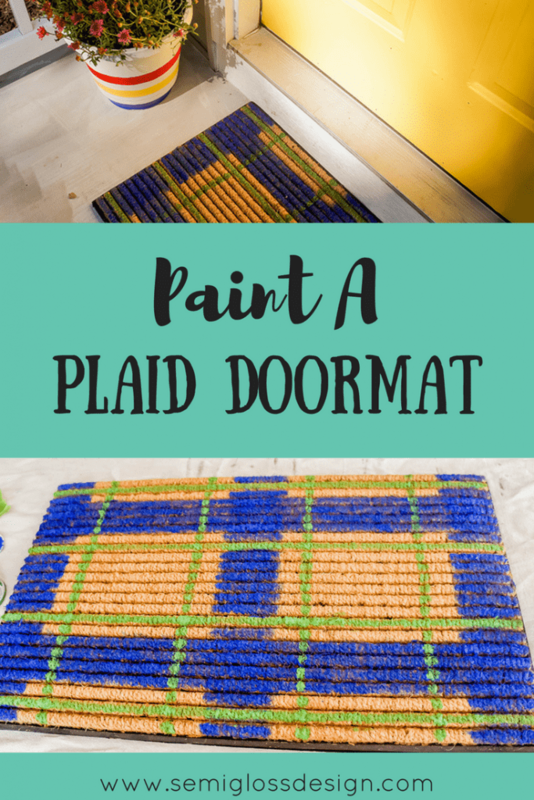 I think a painted plaid doormat is the perfect fall touch! this is such a fun idea! i have an idea for a painted doormat but i have yet to execute.